It's Friday night. You're so broke your power and phone have just been cut off. And your last faded package of Ramen noodles just crumbled into a fine MSG-stained dust in your grubby little hands. Now is the time to either commit yourself to a life of convenience store crime or do something useful. Like, say, mastering the art of scrubbing your upper lip with your nostril hairs or learning to play the three-button accordion, bajo sexto or electric mandolin. That's the giddily off-center feeling that will well up deep inside your rock-numbed soul a few cuts into The American Fogies, Vol. 2 (Rounder). This 25-track excursion through America's ethnicity and eccentricity broadens the definition of eclecticism to the point that you'll find yourself singing along with every Czech, Mexican, Yiddish, Cajun, Native American, Appalachian or Polish melody in some strange new variant of esperanto. 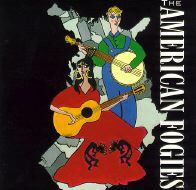 Produced by wandering New York field recording hand (and erstwhile clawhammer banjoist) Ray Alden, The American Fogies showcases the diversity of American ethnic music forms being resolutely preserved, rediscovered or reshaped from California to Croton-on-the-Hudson. All of the recordings were produced and engineered by Alden during a feverish trek across the U.S. that began as a search for old-time rural southern musicians and gradually metamorphosized into a cataloging of all the weirdly resilient styles of downhome, front-porch and/or parlor music still being practiced in some of the most unlikely corners of the country. Nothing is unexpected in the Lone Star State, but Brian Marshall's chirpy, stacatto fiddling and high, lonesome Slavic vocals on the otherwise country-fied Polish folk song, "Pija Kuba," have a decidedly jarring -- and stimulating -- effect. Ditto for "Chitarra Romana," an Italian mandolin number given the New Mexican coffeehouse string-band treatment by The Pastatones, a goofy hodgepodge of displaced New York Italians/Sicilians and Albuquerque folkies. This madcap line-up of whirling mandolins and concertinas includes a guy (John Zito) who actually turned down the chance to sing the part of Johnny Fontaine in The Godfather. Guess he didn't like horses. The presence of a few too many Yankee folk scenesters tends to muddy the waters of tradition a bit too much on songs like "Blue Tail Fly," New Jersey-born Dan Gellert's awkward attempt at blackface minstrelsy. But this is a minor complaint when stacked up against the stark acoustic beauty of Kentuckians Carla Gover and Charlotte Lester's high-mountain gospel duet, "Little Moses," and the lilting, melodic Piedmont blues of cancer-stricken millhand, Turner Foddrell, and his nephew, Lynn Foddrell. Other standouts include the Croton, NY, Columbian dance band, Impacto Vallenato, on the propulsive "La Gota Fria," Houston-based Sabias Espinosa and Freddie Porras's oom-pah-ish Tejano conjunto, "La Repetida" and Mt. Airy, N.C., guitarist Wayne Henderson's dizzying acoustic runs up and down the fretboard on the instrumental, "Chow Time." As a result of the diversity-shy nature of the good old music biz (heavy sigh goes here), you will probably never find this at Best Buy, Sam Goody or in the CD player of someone you meet at the mall. All the more reason to seek it out with a vengeance before you take your next ascetic vow and high-tail it for the high desert in search of some good sand-clogging, a cheap balalaika and some multicultural, polka-playing neighbors.